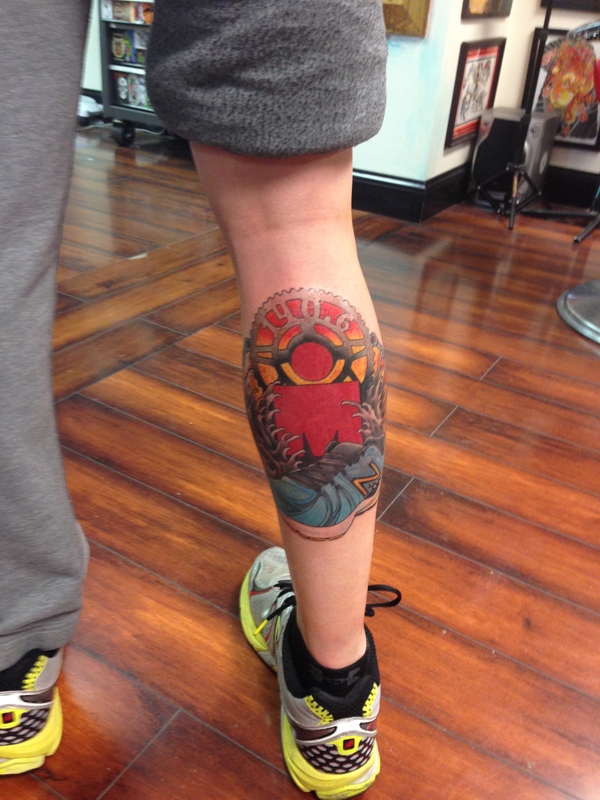 This past Sunday, I finally sat down to get my Ironman tattoo. I had always known I wanted to get a tattoo to remember this moment and stage in my life. It took me quite awhile to figure out what I wanted to get. 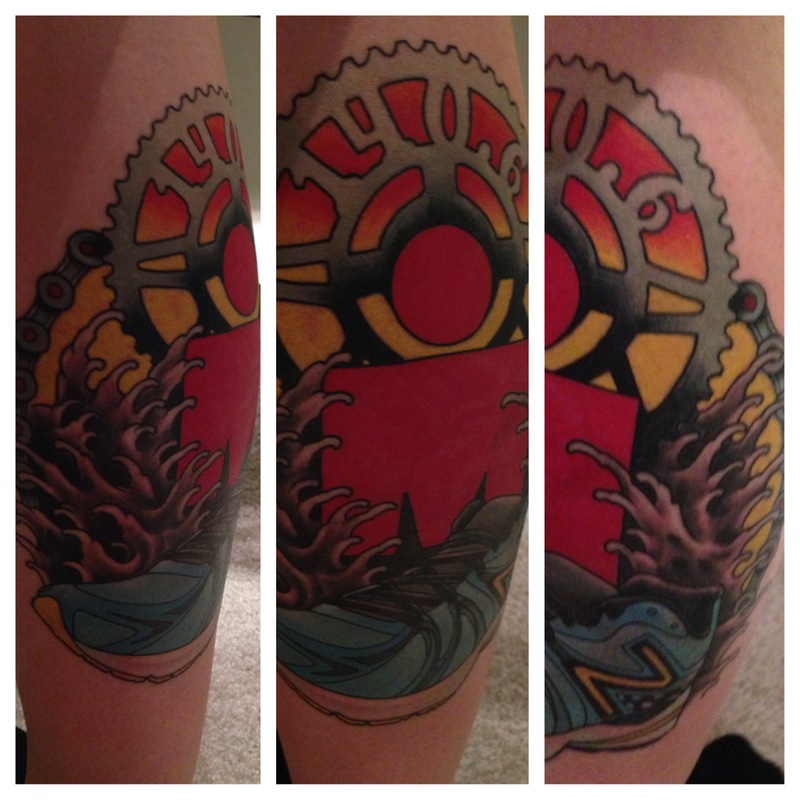 For me, this tattoo represented more than just finishing an Ironman Triathlon. In the beginning of 2010, I began the journey to where I am now. If you had forgotten or are new to the page, I lost just over 100 pounds over the past three years on the journey to becoming an ironman. I wanted something that conveyed strength and resilience but at the same time remembered the roots of my newly discovered passion of triathlon. I have seen some designs on the internet I have liked, but nothing quite fit exactly what I was looking for. I did some research on local tattoo shops and found that Jack Brown’s Tattoo Revival spoke with Mike one of the shop’s artists and in just a few minutes, he seemed to know exactly what I wanted out of this tattoo. I scheduled an appointment with Mike for this past Sunday to finally get this piece done. The tattoo took 5 hours to complete and every minute was awesome to sit through. It reminded me of the strength it took to get where I had gotten myself and the strength it was going to take to stay there. 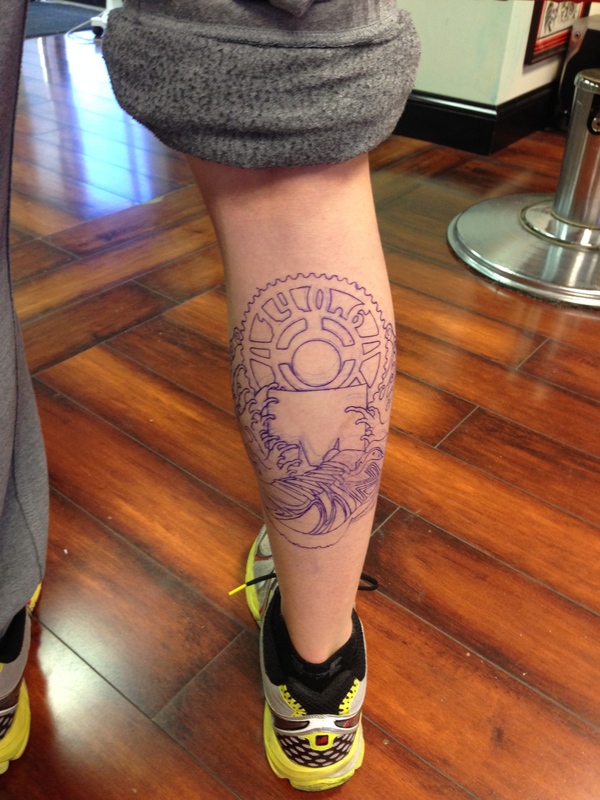 While I was getting the piece done, one of the shop’s other employees came over to ask about the tattoo. I had an opportunity to tell him my story and he shared with me that he was just beginning a journey similar to mine. This coming weekend he will be running his first half marathon, and told me that my story is an inspiration to him. That is really the whole reason behind my tattoo. I wanted to get something recognizable so that people could stop me to ask about it. I did not get the tattoo simply to throw the fact that I have finished an Ironman triathlon in people’s faces. I got it to hopefully inspire others and remind myself of everything I went through to be where I am today. Finished Product 2 days later. Some swelling has gone down. Still some healing to go!